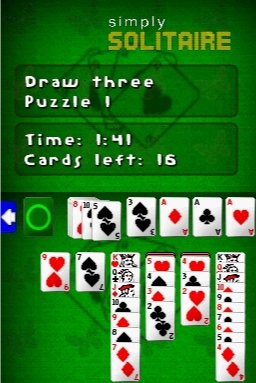 It seems that barely a week goes by without a card game being released for DSiWare, and chances are if you were after a virtual solitaire you would have bought one of the previous releases by now. 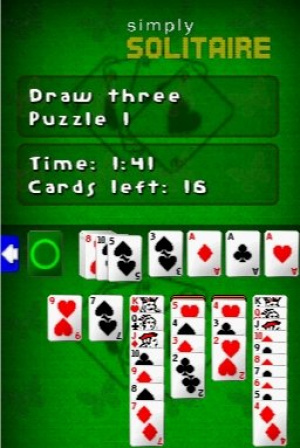 However, Engine Software is hoping to tempt the undecideds with this deck of solitaire games, following the same style as its recent Simply Sudoku release. 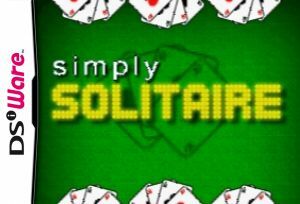 Taking a slightly different approach to 2-in-1 Solitaire’s free-flowing game, Simply Solitaire tasks you with solving certain preset puzzles instead of handing you a randomised game. This limits the frustration of being left with no more moves as you know each game is solvable, and with 100 puzzles there’s plenty to keep you going, so solitaire fans will lap it up. It’s a shame that the game’s technology, such as it is, is so lacklustre. As with Simply Sudoku, there’s no save or resume feature, meaning you have to finish each puzzle before you can attempt another. There’s no pressure to progress – you can go straight to puzzle 100 if you wish – so the ability to pick up and play the same puzzle at your leisure would have been welcome. Also, unlike 2-in-1, there’s no automatic way to place the cards on the right stack, meaning every game ends with you dragging cards from stack to stack or double-tapping each one. Another fiddly decision means moving a card from its column doesn’t automatically turn over the card below, a minor quibble but one that slows the game down. There’s nothing much wrong with Simply Solitaire – it’s only Klondike solitaire, after all – but it’s limited by the same problems that struck Simply Sudoku. The lack of save is disappointing and niggles with the input system prevent this from being the smooth and relaxing pastime it should be, limiting it to card nuts only. Oh this is such a drag. Wait, solitaire card games that are all solvable? That doesn't make sense to me. Minor typo: "As with Simply Sudoku, there’s no no save...". Looks like 5 in 1 is still the way to go. It's too bad they never allow you to use your own music from the SD card in games like this. I used to always sit at my computer playing solitaire and listening to my mp3's, so it seems like a natural combo. Bah, so much for card games. I believe there are already enough Solitairs, just like the Sudokus. Nobody plays sudokus or solitair and can call it fun... really, not even for $2.